Vero Beach native Jake Owen today announced to fans that tickets will go on sale Friday, October 12th at 10:00 a.m. 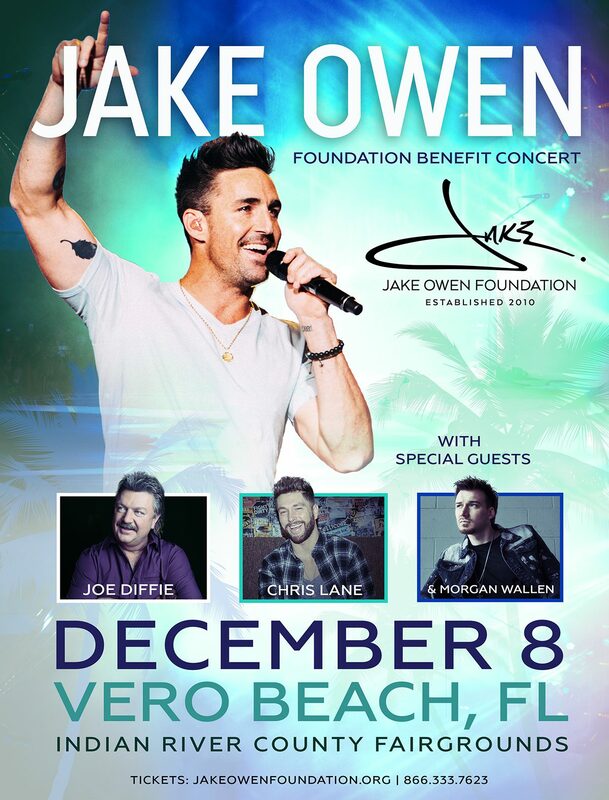 ET for the 12th annual Jake Owen Foundation Benefit Concert on Saturday, December 8, 2018 at Indian River County Fairgrounds in Vero Beach, Florida. The benefit concert will be Jake’s final stop on his 2018 “Life's Whatcha Make It” Tour. Owen will be joined by the legendary Joe Diffie, chart-topping country star Chris Lane and platinum-selling country breakout Morgan Wallen. Tickets for the Jake Owen Foundation Benefit Concert go on sale at 10:00 am via the Jake Owen Foundation website, Jake Owen Foundation Benefit Concert or by calling 866.333.7623. Premier tickets and pit passes are $100, and general admission tickets are $45 (general admission ticket holders may bring their own low beach/lawn chair or blanket). A VIP ticket package is also available for $150, which includes a reserved premier seat, a limited-edition Jake Owen Foundation t-shirt and early entry. The Jake Owen Foundation Support Sponsor ticket package includes eight reserved premier seats in the first 10 rows, a listing on the sponsor board and a limited-edition Jake Owen Foundation t-shirt for $1,200. A Platinum-certified Big Loud recording artist, Owen charted his seventh career No. 1 hit earlier this year with “I Was Jack (You Were Diane).” This is the 12th annual benefit for the Foundation, and this year marks the first time for the outdoor benefit concert to be held at the Indian River County Fairgrounds. Additional special events will be announced in the coming weeks; however, the concert will be the centerpiece of the weekend’s activities. Founded in 2010, The Jake Owen Foundation is committed to helping people, in the places they call home. The Jake Owen Foundation is a nationally active charitable organization, with a local approach. The 2018 Jake Owen Foundation Benefit will continue the successful history of increasing awareness and raising revenues for the Foundations’ mission to assist youth nationwide through St. Jude Children’s Research Hospital, and in Indian River County through the Boys & Girls Club of Indian River County and other local charities. The Jake Owen Foundation has raised more than $1.4 million since its’ first fundraiser in Vero Beach, Fla.
For more information on the Jake Owen Foundation, please visit www.jakeowenfoundation.org. For sponsorship opportunities and VIP packages, contact Michele Cope at 561.394.9190 or via email at MLCope@chevents.com.